Indonesian cuisine is known for its abundant use of spicesrempahnya, so have a rich flavor. One of the most commonly used spice is turmeric. 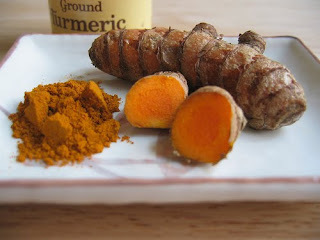 For more than four thousand years, turmeric extract has beenused for cosmetics, textiles and medicine. In India, turmeric is often used as a powder to make the faces of the women lookshine. Not only that, from many studies proved turmeric has manyhealth benefits. Here are the health benefits of turmeric for a variety of studies as quoted from Divine Caroline. - Research at the University of Texas found that curcumin (the active compound in turmeric) inhibits the growth of skin cancercells and slow the spread of breast cancer cells. - Some doctors are also advised to eat curry regularly. That's because turmeric is a major ingredient in curry that can reduce your risk of Alzheimer's disease or dementia. This is evidenced by the low number of the disease in India, wheremasayarakatnya often eat curry. - study in Italy showed patients with osteoarthritis or joint painthat did treatment with turmeric extract the pain was reduced by58 percent. - According to the research team from the University ofMaryland, United States, turmeric helps to cure colitis patients. - In ayurvedic medicine in China, turmeric is used for digestive problems, cleansing the liver and blindly mestruasi cyclesbecome more regular.